Getting wooden floors sanded in pubs presents a huge challenge for you, because you don’t want to close for any significant time and you don’t want a massive clean-up. Right? But it is also a technical challenge for floor sanders too because lacquer won’t get a chance to fully cure as it takes around 10 days and alcohol softens lacquer anyway! So can we offer a solution to all these problems? Well in most cases YES! As Europes largest floor sanding brand we have the manpower and dust free machinery to tackle any size job in the shortest possible time. 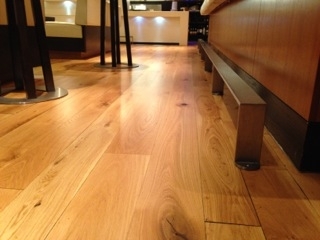 We also have product solutions that are absolutely perfect for the pub environment and that will allow you to open your doors quicker and yet still have protection for your wooden floor. WANT TO KNOW ANOTHER BENEFIT? Do you find that your floor looks great once it’s done but shocking again 6 months later? Well not only are our products fast curing and beautiful but they can also be very easily and cost effectively maintained and restored meaning less downtime and less expensive floor sanding in the future.